January--A day at the beach! 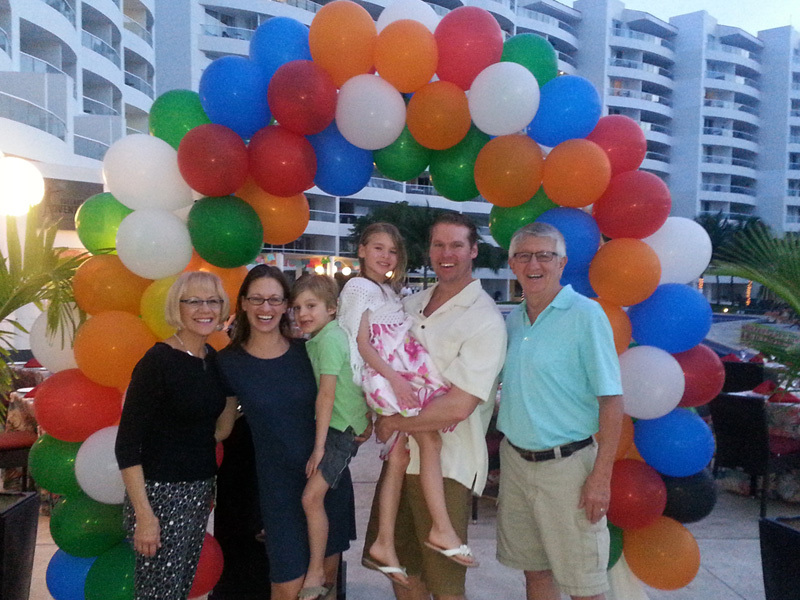 January was another fun-filled month with time spent with family and friends. 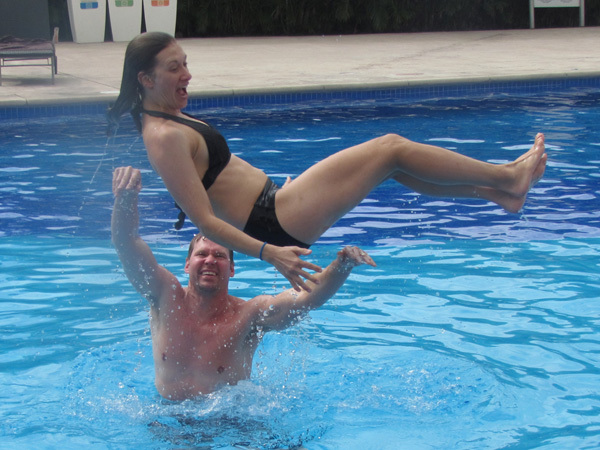 Craig had a week's vacation coming, so he and Denise took the kids out of school and flew to Puerto Vallarta. We drove over and enjoyed four days with them. Later, Larry's life-long friend, Scott McBrayer from Kentucky, flew here from his winter home near Tampa, Florida. 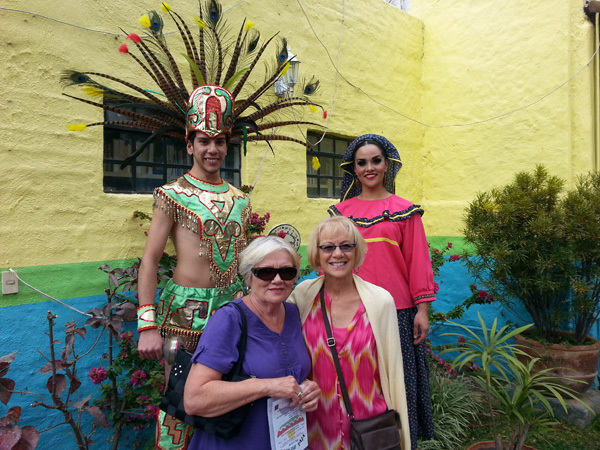 We got to meet his new girlfriend, Lois, who joined him in taking in the sights and sounds of México. Another special month indeed. The people we rent from created one of the nicest gardens in El Parque. 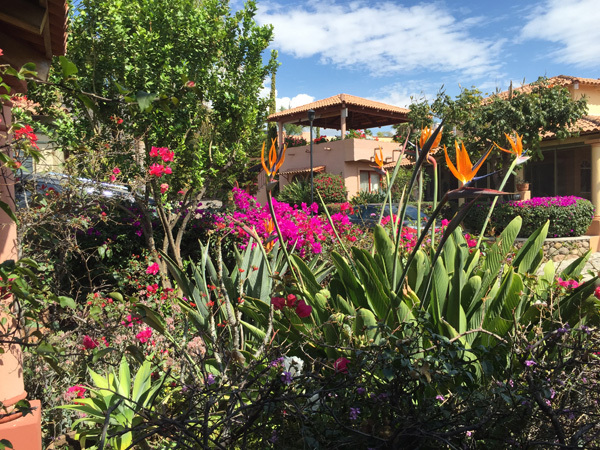 When we got back from our tour of Mexico City in December, we found two "Birds of Paradise" bushes in full bloom, next to the poinsettia and lemon trees. Friends Brian and Marilyn had a very special month also. It was Brian's birthday and their kids flew in from Paris, France and Regina, Canada. 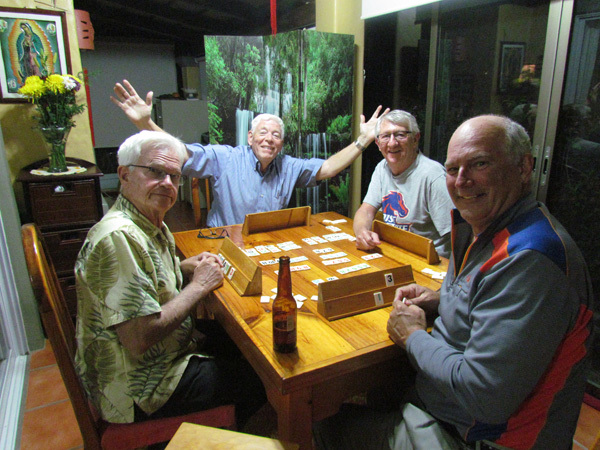 There son-in-law's mother flew in from Melbourne, Australia to enjoy time together. 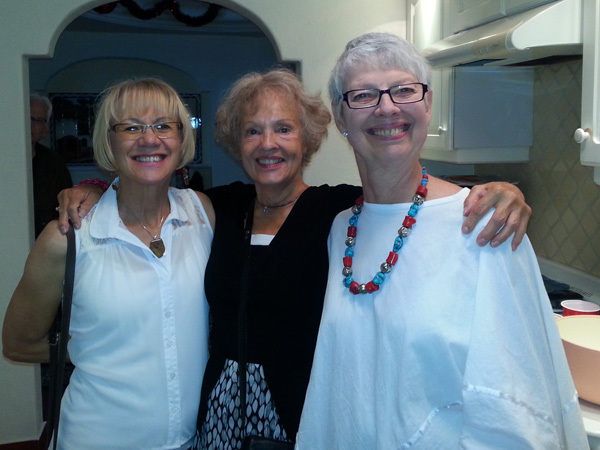 Marilyn hosted a party where dozens of friends came over to meet and greet the family. Larry caught this picture of Glorine, Carolyn and Marilyn having a particularly fun moment. 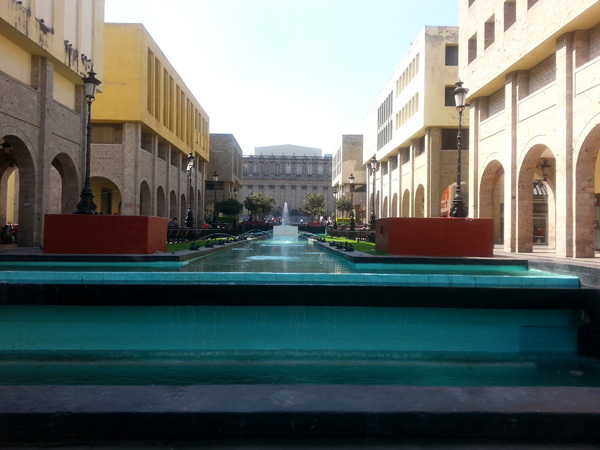 We spent a day shopping in the historic center of Guadalajara, established in the mid 1530s. 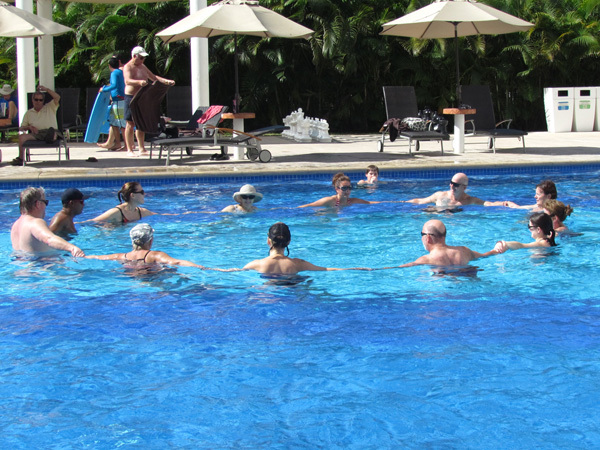 After our Mexico City tour, we have a greater appreciation of the significant culture that lies only thirty miles away. 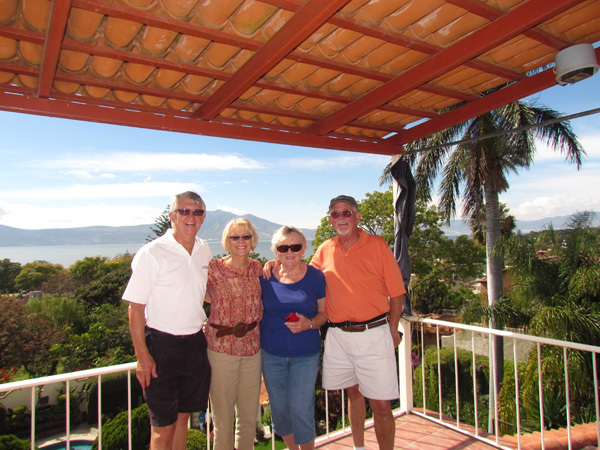 We met up with Denise and her family at an all-inclusive resort near Puerto Vallarta. Our room was a junior suite with a magnificent view of the Pacific Ocean and resort pools and some of the amenities below. Our patio came equipped with a shallow, but more than adequate whirl pool tub. 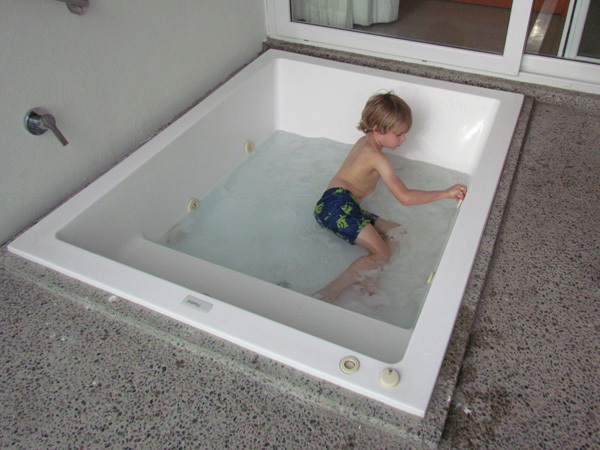 Here Chase is waiting for the tub to fill with hot water, so he could add shampoo, turn on the jets and play in the bubbles. It didn't take long for Clara to make some new friends. 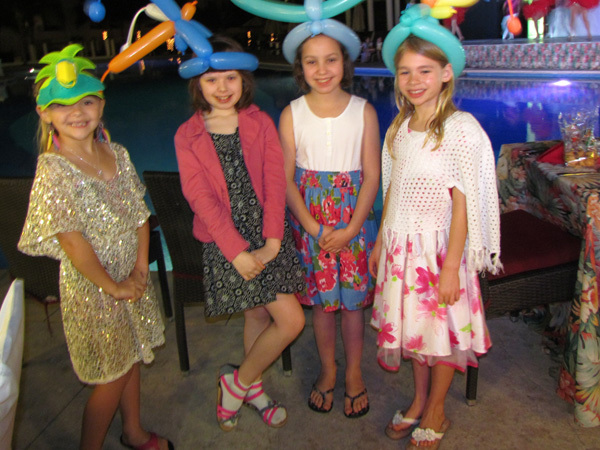 After dinner, they continued to play, thanks to the balloon man that outfitted them with some cool hats. Two of the girls were from Canada and one from Great Britain. Grandpa Larry kept Chase busy teaching him the art of Chess. It was amazing how quickly Chase mastered the moves. 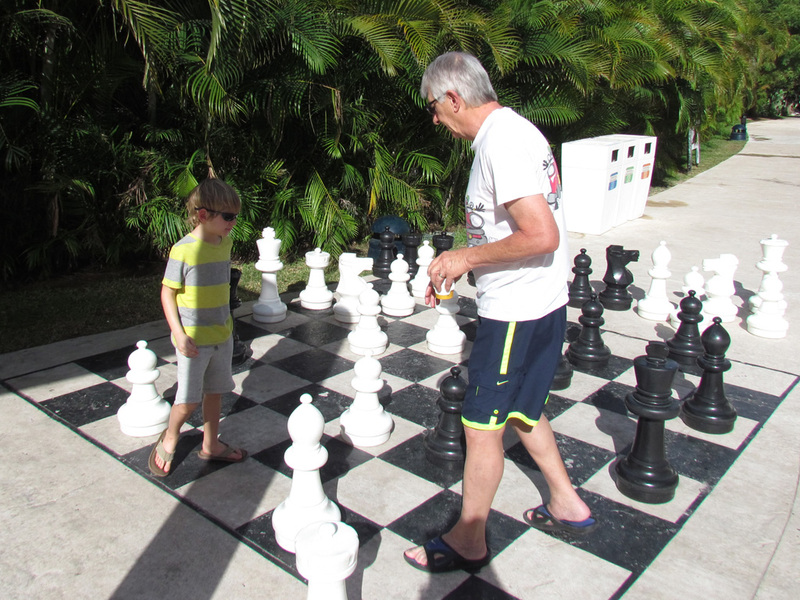 Grandpa was also surprised when Chase "CHECKED" Grandpa's king with his pawn. The weather could not have been better for long walks along the beach. Denise, the dermatology queen, made sure that everyone got lathered up with enough sunscreen. 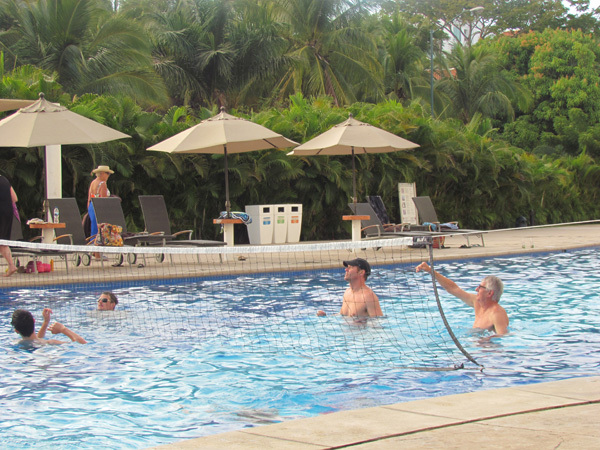 The resort offered a ton of activities to fit everyone's fancy. Glorine took advantage of water aerobics and was amazed at how good a workout it was. 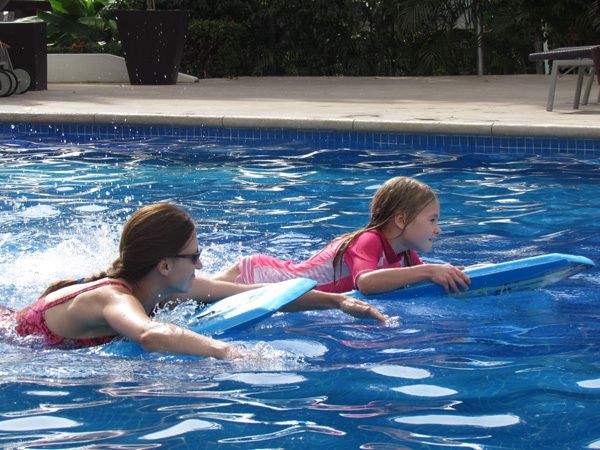 One fun afternoon we enjoyed watching Denise and Clara join in on a "boogie board" race across the pool. Clara took first place in the kids division and Denise took first in the women's competition. Well Done! 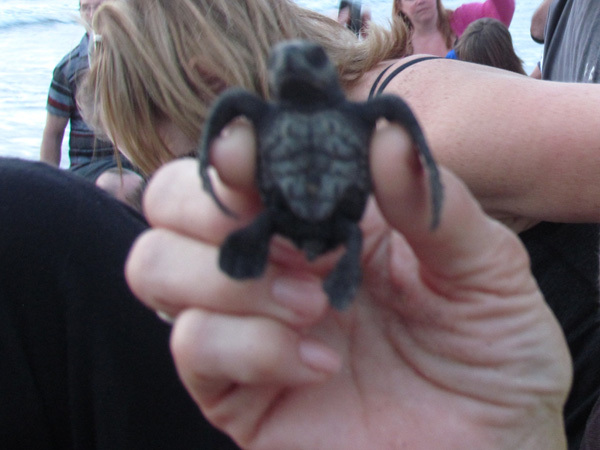 Hundreds of these endangered baby sea turtles hatch near the resort each day. The rangers comb the beaches for these newborns. By the end of the day, we held one, named it, and released it into the ocean. CLICK ON PICTURE. 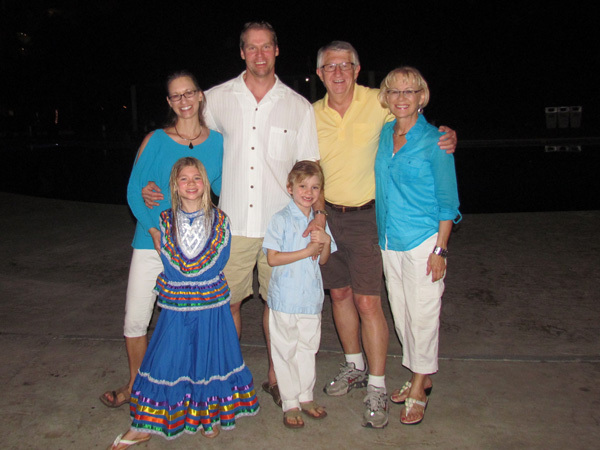 Grandma Glorine surprised Clara and Chase with new Mexican outfits we bought in Guadalajara, which fit perfectly. 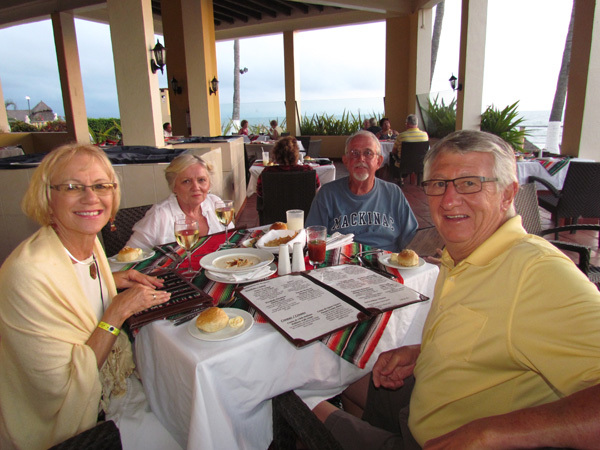 They got to sport their new attire at the resort's Mexican Restaurant. The waiters all said "muy bonito!" 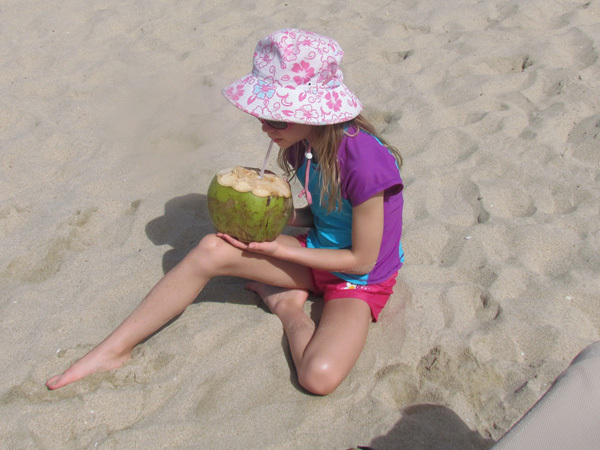 Clara is enjoying coconut water, what some people are calling Mother Nature’s sports drink. It is low in calories, naturally fat- and cholesterol free, more potassium than four bananas, and super hydrating. She took all the energy she got from the coconut and put it to good use. 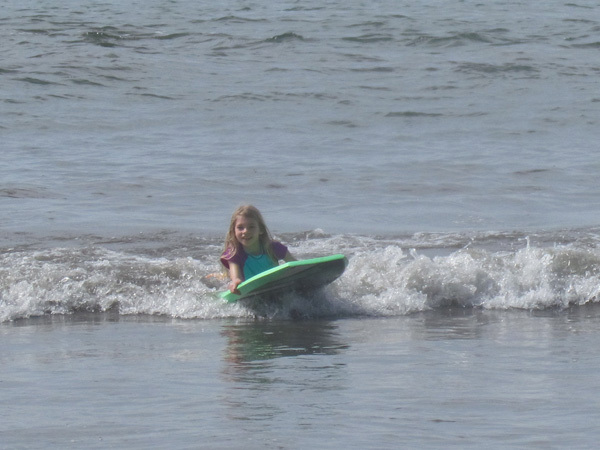 She rode a boogie board all the way to shore. 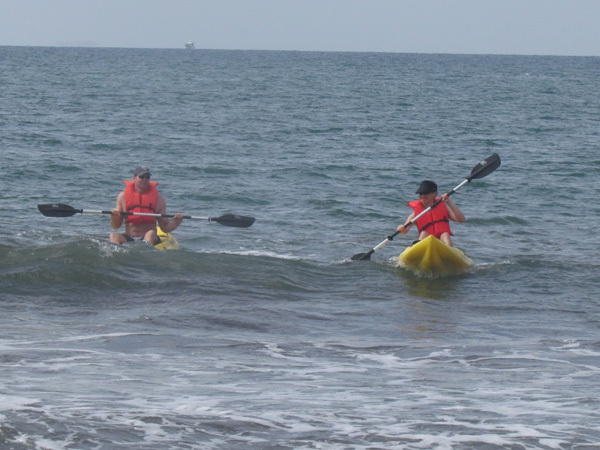 The resort had kayaks, so Craig and Denise took advantage and road them for a mile or so along the shoreline. Craig is a pilot and here it looks like he is trying to teach Denise how to fly! 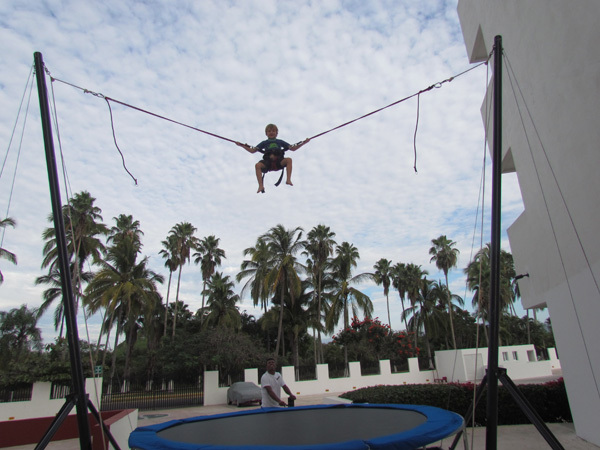 Chase did some flying also, but he was strapped into a harness and used a bungee cord and a trampoline. 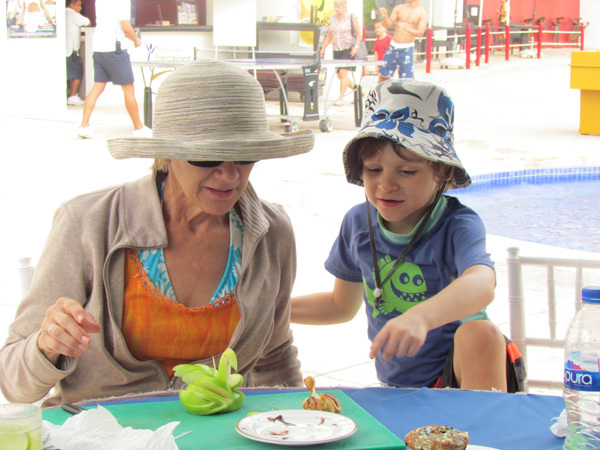 Grandma Glorine and Chase had a great time making swans out of apples and cream puff (then he ate them). Three on three volley ball is harder than it looks. But fun and exhilarating none-the-less. 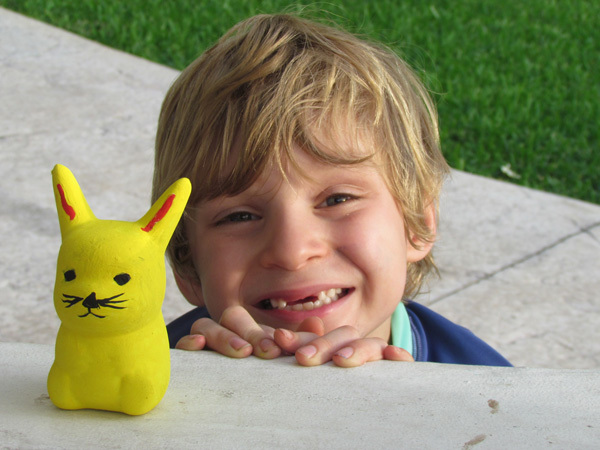 Chase loved spending time at the Kids Zone, where he worked on lots of projects, including this bunny. Our last night together we watched these performers juggling, baton twirling, dancing and gymnastics with fire. 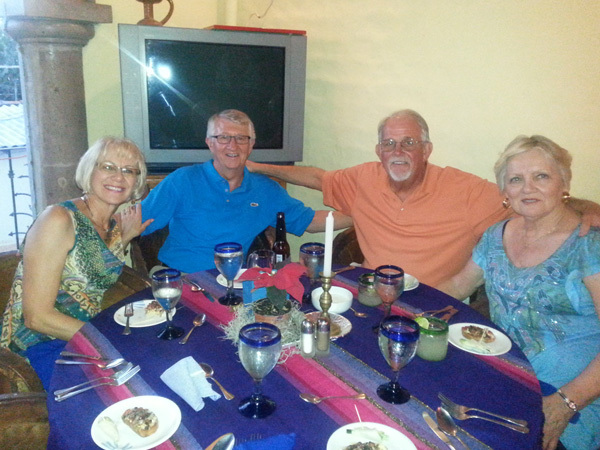 Wayne and Maureen hosted a birthday dinner and game night for Larry--the night we returned from Puerto Vallarta. Guess who was the big winner? 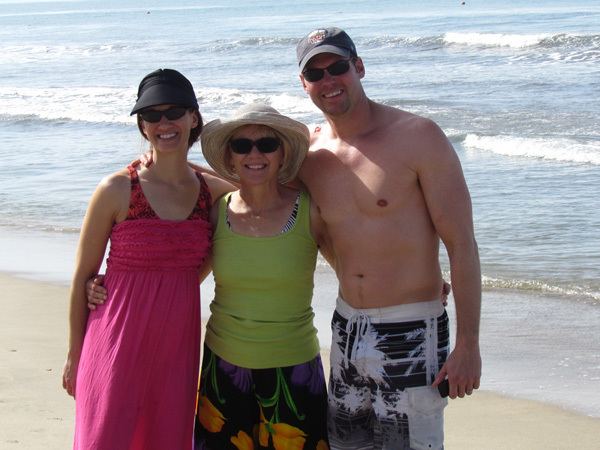 Larry's best friend, Scott, from graduate school days and his new partner, Lois, came down to spend two week with us. They made it in time to help celebrate Larry's birthday. 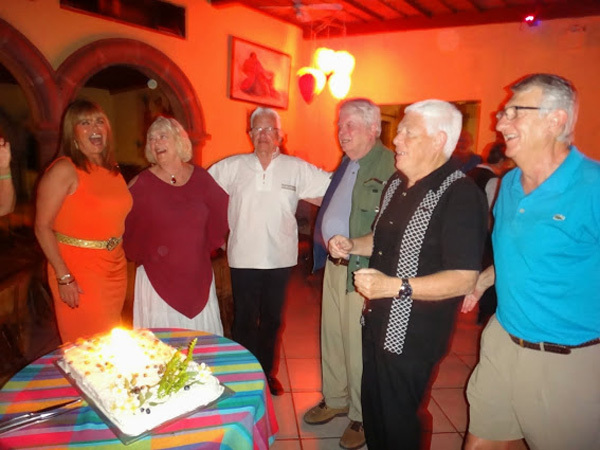 Larry and five other January birthday honorees had a great night with about 50 guests at a local night club, with dinner and music. Best of all, they were all friends. 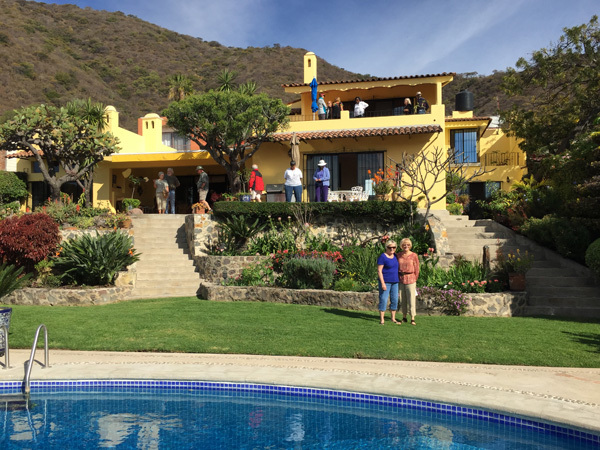 We took Scott and Lois on a "Behind the Walls" home tour of some of the most exclusive homes in Ajijic. From the front they looked "BLAH," but once inside it was all WOW! One things these homes have are great views of the lake. This one had a 360 degree unobstructed view of the mountains and lake, along with great sunrises and sunsets. 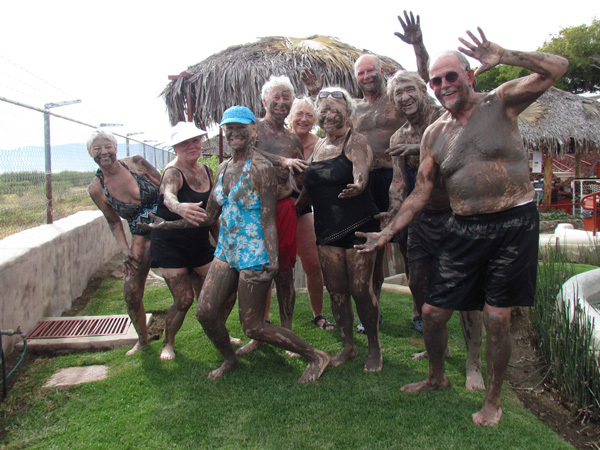 The geothermal hot springs west of Ajijic was a treat for both Scott and Lois. 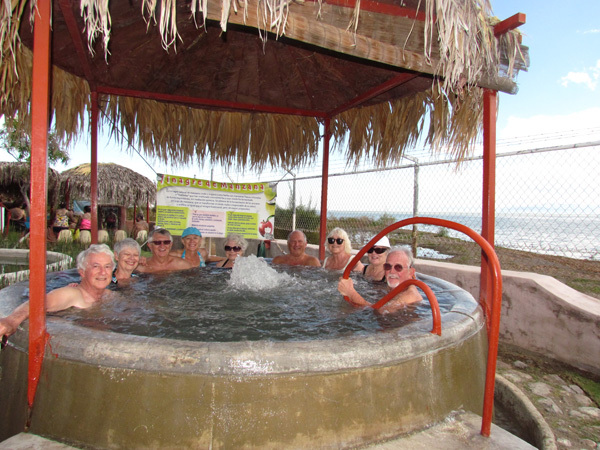 It was their first experience with hot tubs filled with herbal and medicinal properties. Clay mud was a part of the treat. After we applied the mud, Larry led the group through a few Tai Chi moves allowing enough time for the mud to dry. What a fun time it was! 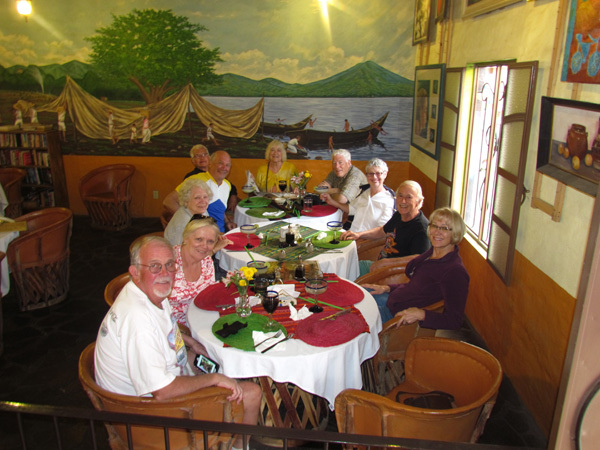 We got cleaned up from all the mud and went to Viva Mexico, our favorite restaurant near the spas. Best margaritas and the best/cheapest meals lakeside. 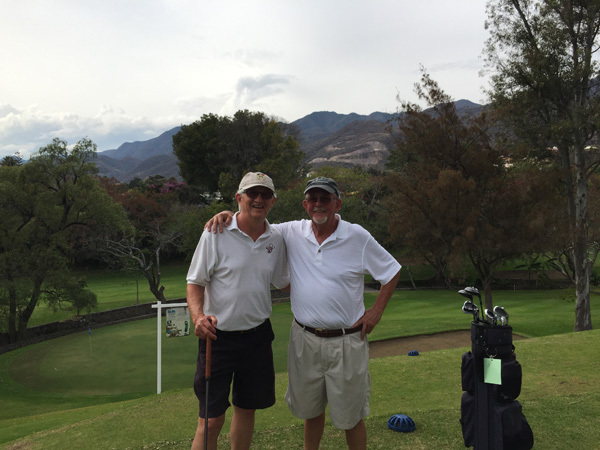 Scott has been a golfer since childhood so we headed to Chula Vista, a cool nine hole golf course carved into the foothill of Lake Chapala. The views are spectacular. 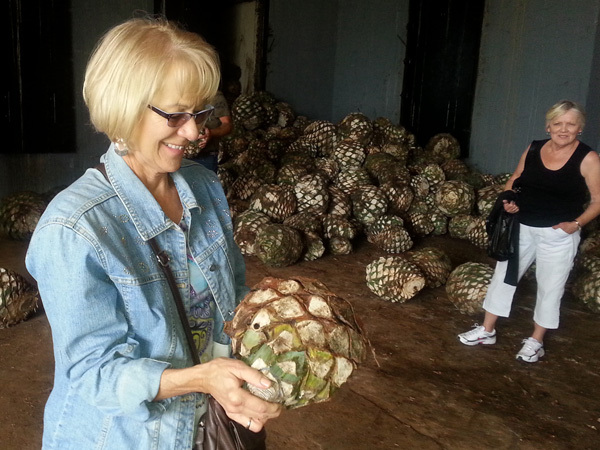 We took a four-day road trip, including the town of Tequila, 60 miles west of Guadalajara. 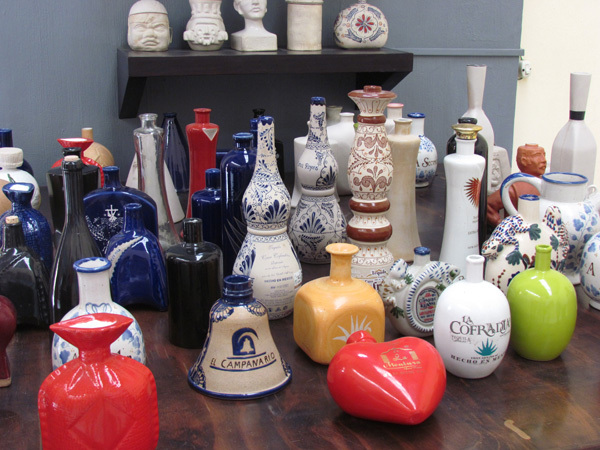 This is what their keepsake is distilled from--the Blue Agave (ah-gah-veh) plant. 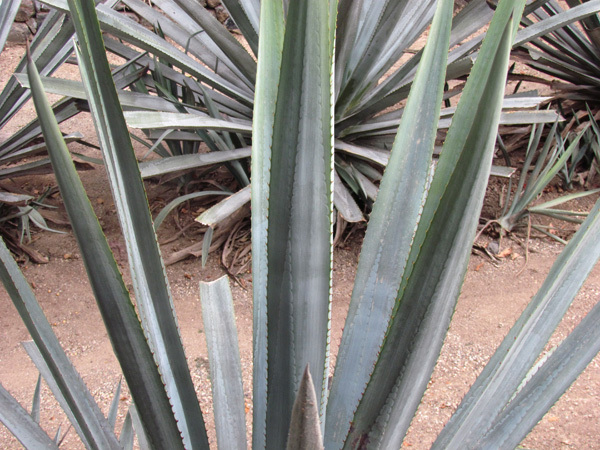 It takes five+ years for agave to mature. 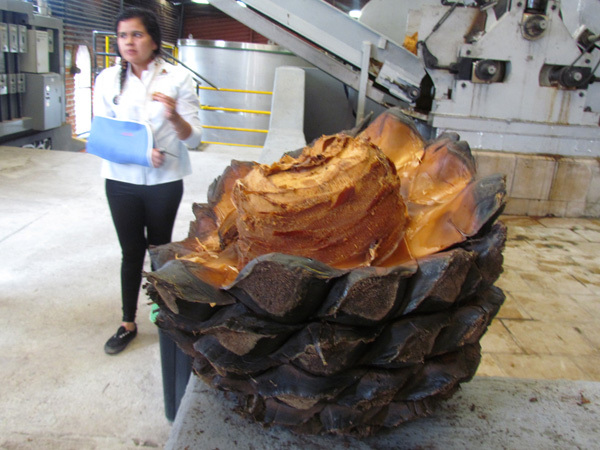 The stalks are removed by hand and what is left is this piña, which weighs about 25 pounds. Here it is ready to go into an oven. It is slowly baked to break down their complex starches into simple sugars. Then, the baked piñas are shredded and mashed to squeeze out the liquid and then fermented. Since our last visit to this distillery, they started making their own specialty designed decanters--all from scratch. This pretty much doubles the cost of a bottle of Tequila. 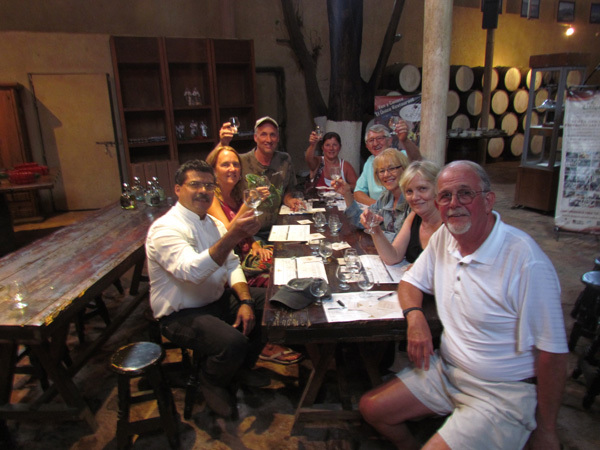 We got to sample 3 types of sipping Tequila made from 100% Agave--Blanco (no aging), Reposado (aged in whisky barrels for 8 months) and Anos (aged for a year or longer). 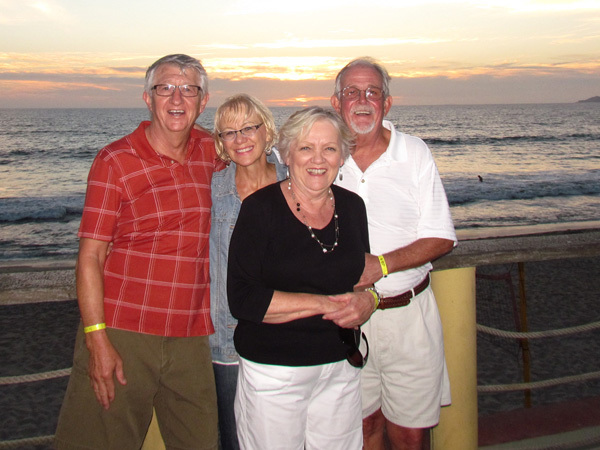 After a night in Tequila, we drove to an all-inclusive resort near Puerto Vallarta. This is the first time Lois had seen the Pacific Ocean and what impressed her the most were all the mountains. They don't have them in Florida! All you can eat--all you can drink, so that is what we did. The resort had 3 restaurants to choose from with menus loaded with some mighty fine food. 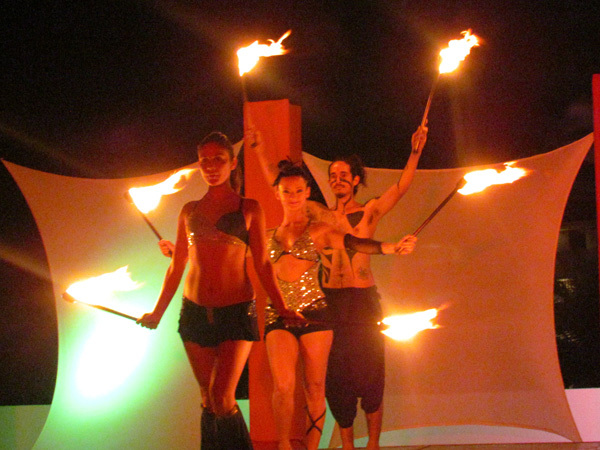 Evening entertainment included dancing on the beach, fire dancers and more. 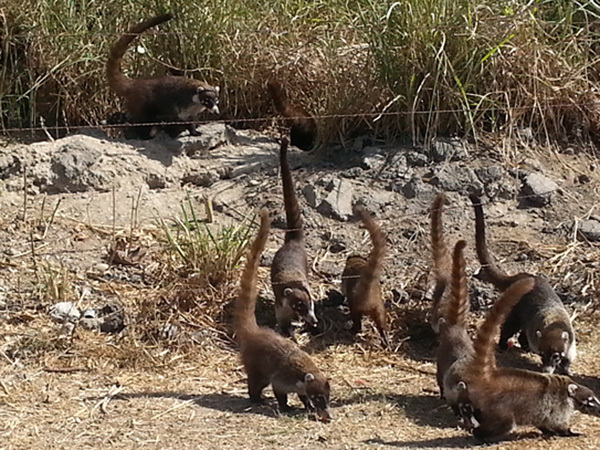 As we biked one morning we ran into the most mischievous members of the raccoon family called Coatimundi. They are forest dwellers living mostly in Mexico and south. They are agile tree climbers and love lizards, birds, insects and fruit. Years ago, Scott and Larry did a lot of "body surfing" in the Atlantic Ocean off the shores of the Outer Banks of North Carolina. 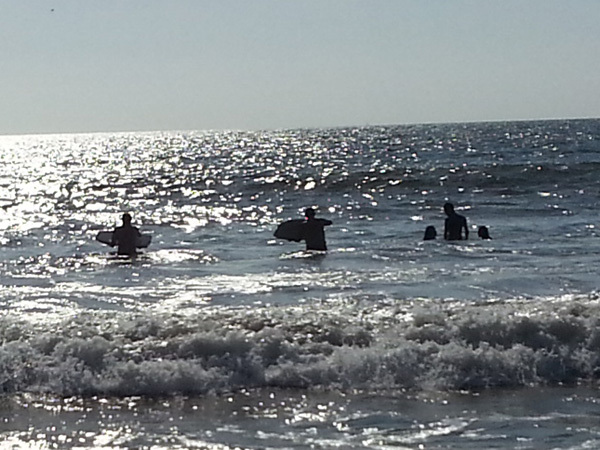 Here they are using boogie boards in search of one more big wave they can ride up on to the beach. Sunsets are beautiful, where ever you are. What makes them special is sharing them with friends and loved ones. 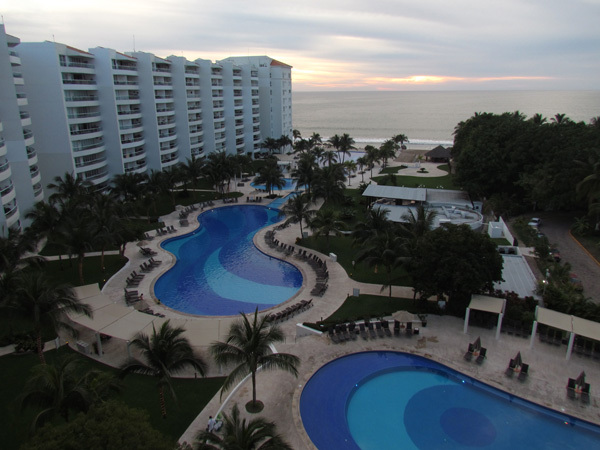 We enjoyed three sunsets at the resort--then back to Ajijic. 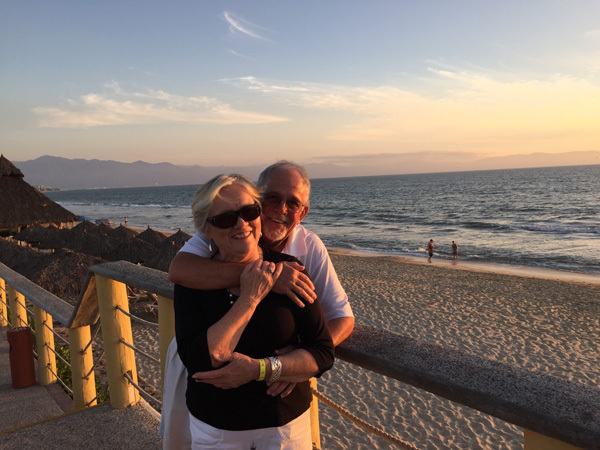 Scott and Lois got to take in a Latin Festival which included Tequila tasting, pre-Columbian and Spanish dancers, Mariachi music and food that makes Mexico so special. 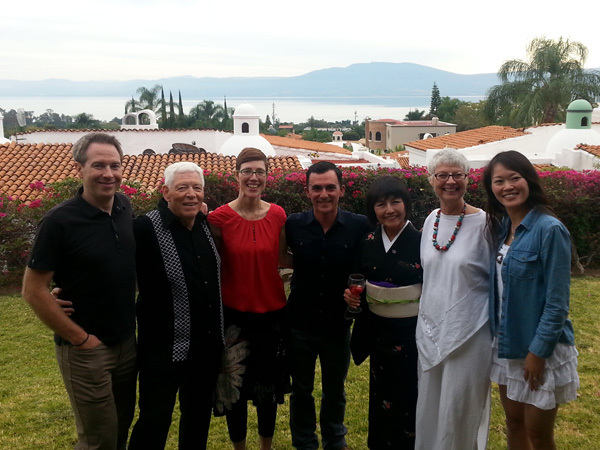 The Lake Chapala Society hosted this event as a fundraiser, which was a sell out. 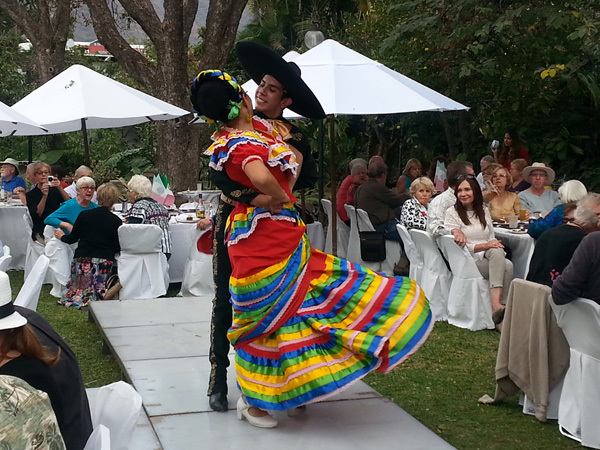 Here is a traditional folkloric dancer entertaining us as we dined on food catered by one of the finest restaurants from Guadalajara. 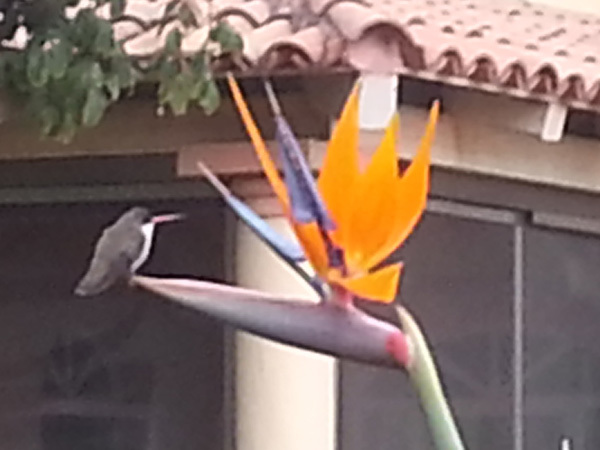 While Scott and Lois were here, they noted all the Humming birds in our garden enjoying the nectar of the Birds of Paradise. Glorine is the pretty one on the right and Larry is the one with the big beak waiting to give her a kiss.